general pulse rauise jog then feeders with ball and players then runa around a pole then to a server and volley 1. inside of each foot 2. outside of foot 3. laces .4. chest & volley 5. header, swap after each one 30s each. servers inbetween perform lunge matrix and squat matrix. 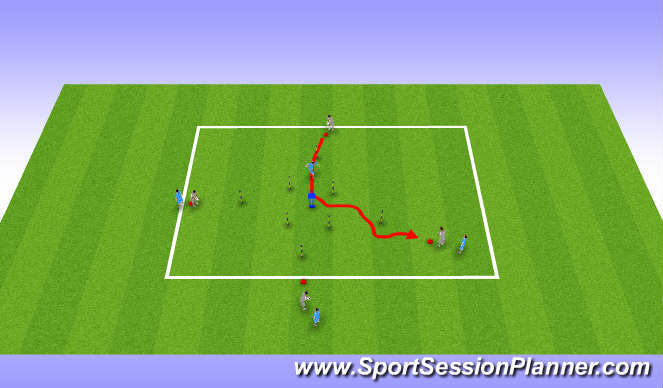 on command each player performs run thru to other side ensuring that cross with opposite player on other side. then repeat but turn to the right as shown in diagram. then repeat but turn to left. players react from player with the ball bouncing on ground as signal to go. next progression player opposite acts as a feeder and as player runs through then must recieve ball from a pass and pass back. Once feeder recieves the ball back that is their signal to go. 30s work each componenet.